A group of researchers from the Faculty of Physics at the University of Warsaw has shed new light on the famous paradox of Einstein, Podolsky and Rosen after 80 years. They created a multidimensional entangled state of a single photon and a trillion hot rubidium atoms, and stored this hybrid entanglement in the laboratory for several microseconds. The research has been published in Optica. In their famous Physical Review article, published in 1935, Einstein, Podolsky and Rosen considered the decay of a particle into two products. In their thought experiment, two products of decay were projected in exactly opposite directions—or more scientifically speaking, their momenta were anti-correlated. Though not be a mystery within the framework of classical physics, when applying the rules of quantum theory, the three researchers arrived at a paradox. The Heisenberg uncertainty principle, dictating that position and momentum of a particle cannot be measured at the same time, lies at the center of this paradox. In Einstein's thought experiment, it is possible to measure the momentum of one particle and immediately know the momentum of the other without measurement, as it is exactly opposite. Then, by measuring the position of the second particle, the Heisenberg uncertainty principle is seemingly violated, an apparent paradox that seriously baffled the three physicists. We now know that this experiment is not, in fact, a paradox. The mistake of Einstein and co-workers was applying one-particle uncertainty to a system of two particles. If we treat these two particles as described by a single quantum state, we learn that the original uncertainty principle ceases to apply, especially if these particles are entangled. 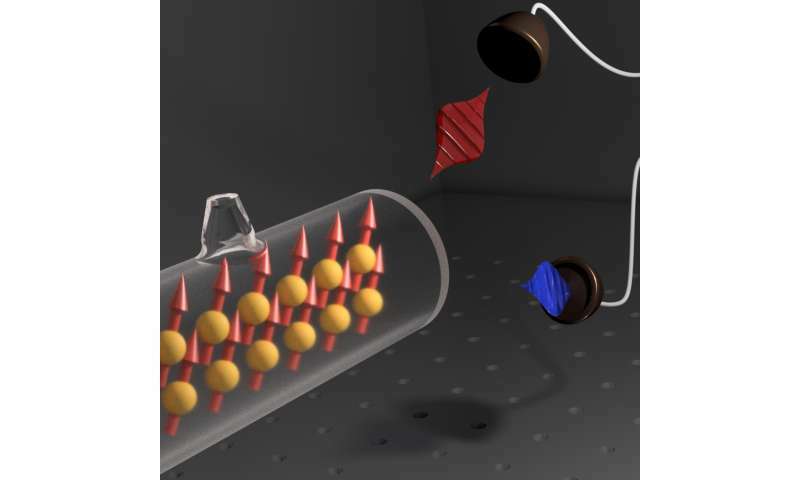 In the Quantum Memory Laboratory at the University of Warsaw, the group of three physicists was the first to create such an entangled state, which consisted of a macroscopic object—a group of about one trillion atoms, and a single photon. "Single photons, scattered during the interaction of a laser beam with atoms, are registered on a sensitive camera. A single registered photon carries information about the quantum state of the entire group of atoms. The atoms may be stored, and their state may be retrieved on demand," says Michal Dabrowski, Ph.D. student and co-author of the article. The results of the experiment confirm that the atoms and the single photon are in a joint entangled state. By measuring the position and momentum of the photon, the researchers acquired all information about the state of atoms. To confirm this, polish scientists converted the atomic state into another photon, which was measured using the same state-of-the-art camera. "We demonstrated the Einstein-Podolsky-Rosen apparent paradox in a very similar version as originally proposed in 1935, but we extended the experiment by adding storage of light within the large group of atoms. Atoms store the photon in the form of a wave made of atomic spins containing one trillion atoms. Such a state is very robust against loss of a single atom, as information is spread across so many particles," says Michal Parniak, Ph.D. student taking part in the study. The experiment is unique in one other way, as well. The quantum memory storing the entangled state allows for storage of up to 12 photons at once. This enhanced capacity is promising in terms of applications in quantum information processing. "The multidimensional entanglement is stored in our device for several microseconds, which is roughly a thousand times longer than in any previous experiments, and at the same time, long enough to perform subtle quantum operations on the atomic state during storage," explains Dr. Wojciech Wasilewski, group leader of the Quantum Memories Laboratory team. The entanglement in the real and momentum space, described in the Optica article, can be used jointly with other well-known degrees of freedom such as polarization, allowing generation of so-called hyper-entanglement. Such ideas constitute a new and original test of the fundamentals of quantum mechanics, a theory that is unceasingly mysterious, yet offers immense technological progress.